So for those of you who may not know my style of eating - I would describe it as "primal." About 3 years ago I really started turning around my diet. I was always active, but that didn't necessarily translate into the way my body should be working & feeling. I seemed to have stomach issues often & would occasionally feel really bloated for days at a time. I originally thought it was because I was lactose intolerant so I cut out all dairy for months. I even tried being vegan for a 6 month period & didn't find many beneficial changes. I slowly started to eat less grains, but girl I LOVE bread so that was super hard at first. About a year and a half ago, my fiance started hearing about the Primal Blueprint & together we did some research. It seemed pretty awesome & honestly a little surreal, that your body could begin to use fat as energy rather than glucose. To put it shortly, eat less sugar (including grains because that is a lot of simple carbs!) & eat more high quality fats and your body will begin to just burn fat for its energy rather than sugar. It blew my mind because I was always encouraged to eat huge bowls of pasta the day before a track meet or lots of bread the day of a race - this theory was to "store carbs" for my body to use as energy. But the more research we did & the more we stuck to this way of eating, the more I realized that my body was able to work so much better & run so much more efficiently. I'm not sponsored by Primal Blueprint, nor is this a paid post. I honestly just wanted to share with you the way I eat now because it has felt like I've stepped out of a haze. This sounds crazy but my vision is more clear, I have consistent energy throughout the day (rather than experience the afternoon crash) & I feel like my body is capable of anything. My body fat is at the lowest & healthiest I have ever been (yes, I have lost fat even though I eat a crazy amount of it!) & I don't experience the same stomach things I used to. Now, I will be completely honest & say I do totally go off track occasionally. My mom makes the best Russian crepes so when I am in San Diego I eat those... I'll eat pizza or a piece of bread with butter occasionally when I'm out at dinner with friends... thus is life. But these "off track meals" don't come without a price. My stomach definitely feels the difference a few hours later & I pay for it haha. But sometimes that's okay. 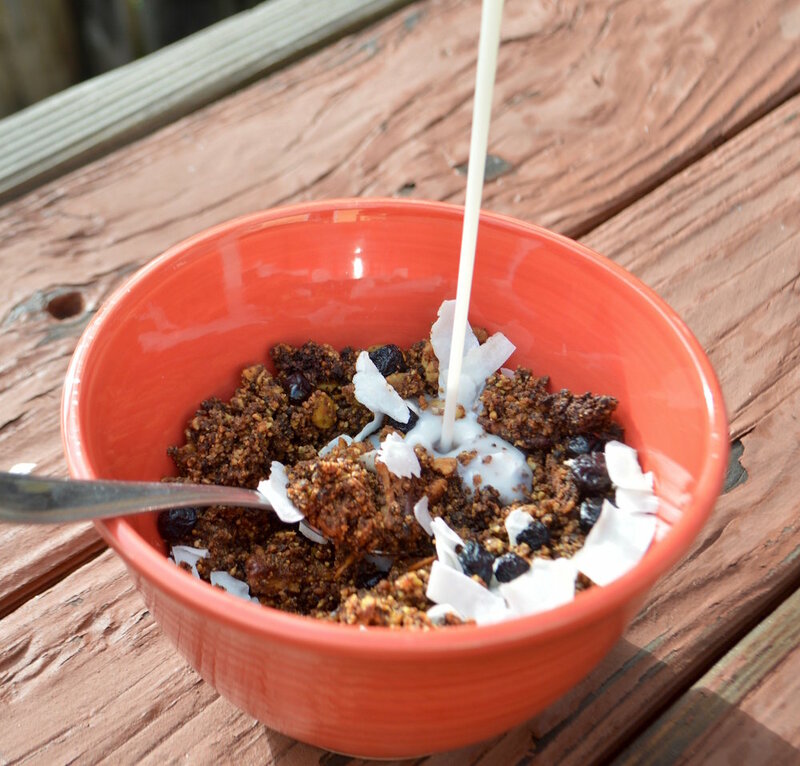 Okay here is the recipe I promised, grain free cereal that is super yummy!